Explore how senseFly drone solutions are employed around the globe — from topographic mapping and site surveys to stockpile monitoring, crop scouting, earthworks, climate change research and much more. 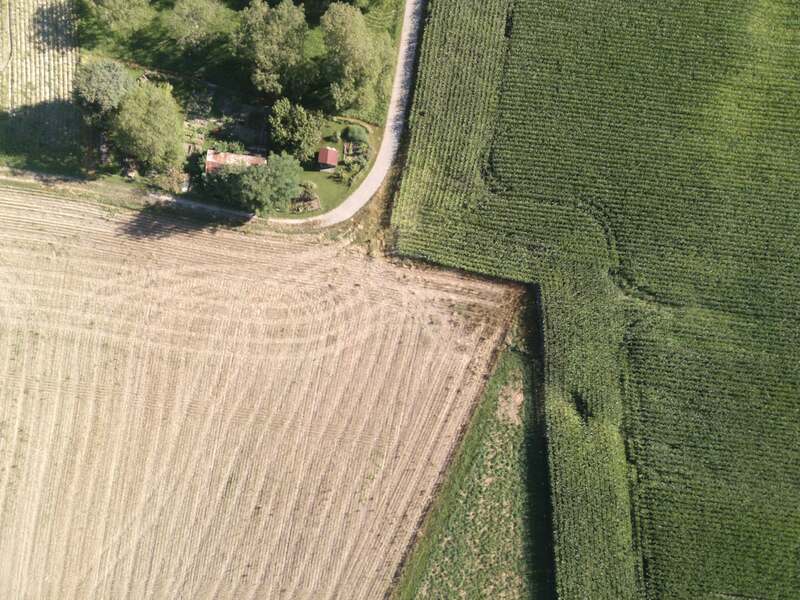 This dataset of mixed-use agricultural fields was collected in Assens, Switzerland during winter 2018/2019. The 220 ha (544ac) site was mapped with a single 75-minute senseFly eBee X drone flight (with the platform’s Endurance Extension activated) and the drone was carrying a MicaSense RedEdge-MX multispectral camera. 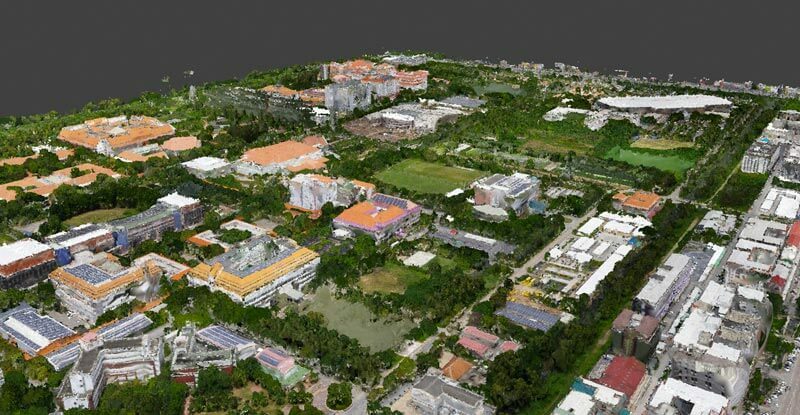 This dataset of Thammasat University campus in Bangkok, Thailand was collected by a senseFly eBee X drone carrying a senseFly Aeria X photogrammetry camera. This gravel quarry in Johnson, Vermont (USA) was surveyed with an eBee X drone carrying a senseFly Aeria X camera. The flight height was planned at 122 m (400ft) AED at an estimated GSD of 2.54cm/pix (1 inch). However, because of the depth of the quarry, the final GSD was 3.59 cm (1.41 in)/pixel. 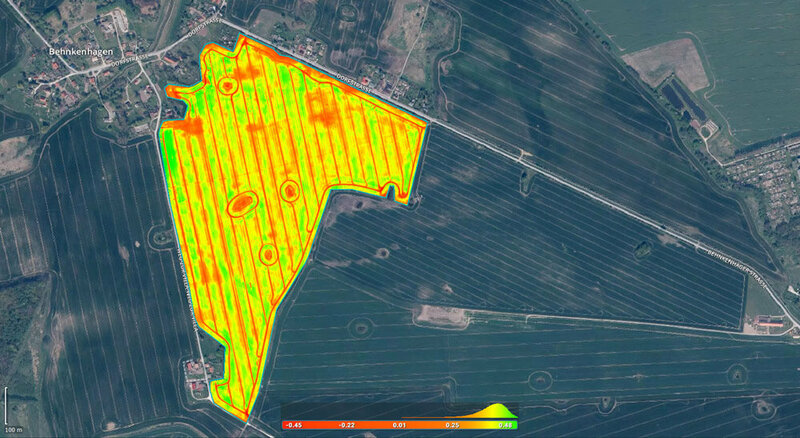 This wheat field in Rostock, Germany was mapped using an eBee SQ agriculture drone, which carries a Parrot Sequoia+ camera. The flight’s multispectral images were processed to create the NDVI and cloud dataset below using Pix4Dfields software. This dataset is courtesy of Pix4D. The gravity dam in Salanfe, Switzerland has a storage capacity of 40 million cubic metres. It is 52m high, 40 m wide at the base, with a 608 m top length. This dataset was collected with an eBee X carrying a senseFly S.O.D.A. 3D camera. The area near Playa Bonita was once used by the U.S. Army as a military base, but in recent years has undergone a surge of development. The beach itself is somewhat rocky but borders a calm section of the Pacific Ocean. This dataset was collected in a single flight by an eBee X carrying a senseFly S.O.D.A. 3D camera. This drone mapping flight took place over the largest technology park in Switzerland. This dataset was acquired with an eBee Plus drone in VRS RTK mode carrying a senseFly S.O.D.A. camera. This dataset displays an industrial estate situated on the Venoge River in Switzerland – a mixed landscape featuring a railway, earthworks, construction and buildings. This dataset was collected by a senseFly eBee Plus drone using a VRS-RTK workflow and carrying a senseFly S.O.D.A. camera (this dataset was also featured in the senseFly/Esri webinar Drone to GIS Explained). This dataset was collected on the island of Torbjørnskjær, located 10 km (6 mi) off the Norwegian coast at the entrance of the Oslo fjord. It was collected with a (now-discontinued) senseFly albris drone. This was flown in Automatic mode using its eMotion software’s Point of Interest and Horizontal Mapping mission blocks. This corridor project mapped a new Swiss road construction. The drone used was an eBee Plus carrying a senseFly Corridor camera kit, a platform enhancement for linear mapping, which positions the drone’s senseFly S.O.D.A. photogrammetry camera in a portrait position for greater mapping efficiency. This is a dataset of the Great Aletsch Glacier, the largest glacier in the Alps. The data was collected during one eBee Plus flight. The drone carried a high-resolution senseFly S.O.D.A. RGB camera and PPK was used to precisely georeference the data. Due to the mountainous terrain, the flight was planned in eMotion 3 based on SRTM elevation data. Read the Whitepaper. This dataset was collected by a senseFly albris drone (now discontinued), which was used to inspect an electricity transmission tower near senseFly HQ in Switzerland. The drone was operated in Interactive ScreenFly mode. Read the albris Accuracy Whitepaper. This dataset was collected by a senseFly albris drone (now discontinued), which flew 360 degrees around a GSM tower close to senseFly HQ in Switzerland. The drone was operated in Autonomous Mapping mode using eMotion’s Around Point of Interest mission block. Read the albris Accuracy Whitepaper. This small industrial estate dataset was collected by a single eBee Plus drone carrying a senseFly S.O.D.A. camera. The images were processed using Pix4Dmapper. The flight was carried out in RTK VRS mode with 99% of fixed geotags. This RGB crop dataset was collected in Switzerland by an eBee SQ drone carrying a Parrot Sequoia camera. The images were processed with Pix4D software. 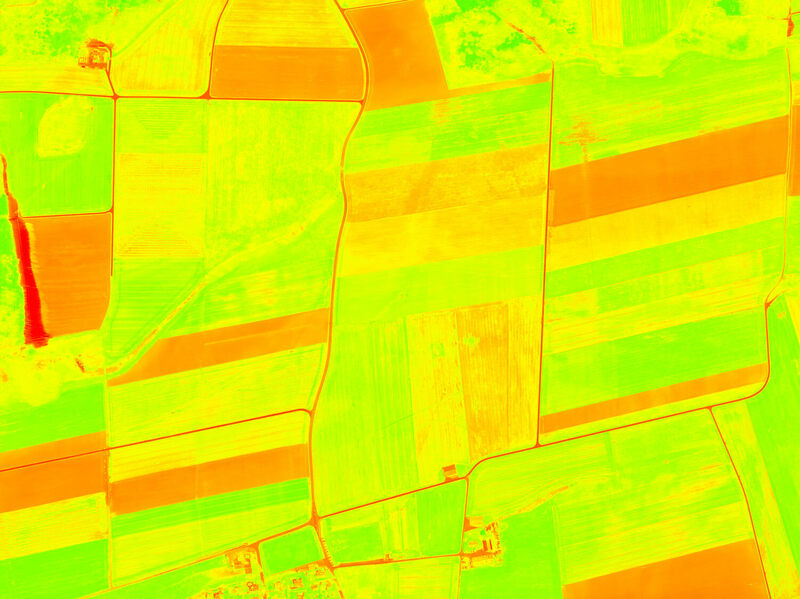 This multispectral crop dataset was collected in Switzerland by an eBee SQ drone carrying a Parrot Sequoia camera. The flight’s images were processed to create the NDVI map below using Pix4D software. This inspection dataset of a concrete arch dam in Switzerland was collected by a senseFly albris drone (now discontinued). The drone was operated in Interactive ScreenFly mode with the following features activated: Distance Lock (set to 3.5 m), Cruise Control (set at 0.2 m/s) and Auto-Trigger (one image every 5 sec). This dataset was collected by a senseFly albris drone (now discontinued), which was used to map a vertical rockface in a quarry in Switzerland. The drone was operated in Interactive ScreenFly mode and flown a distance of 150 m (492 ft) due to a lake blocking the access to the rock face. This dataset of Le Bourget airport in Paris was collected by two eBee Classic drones flying simultaneously. The images were processed using Pix4D software. This dataset of a Swiss gravel quarry was collected by a single eBee Classic drone carrying an RGB camera. The images were processed using Pix4D software. This oblique imagery dataset was collected by one eBee Classic drone, flying at a pitch angle of -50° and carrying an RGB camera. The imagery was processed using Pix4D software. This is an example dataset of a small Swiss village called Merlishachen. The imagery was collected during a single eBee Classic drone flight and processed using Pix4D software. This Swiss quarry dataset was collected during a single eBee Classic drone flight and processed with Pix4D software. This thermal dataset of a solar field installation was collected in Switzerland by an eBee Classic drone carrying a (discontinued) senseFly thermoMAP camera. The images were processed using Pix4D software. Index maps showing temperatures are supplied in ‘Other outputs’.